Johannes Ockeghem (c.1420–1497) served in the French royal chapel from 1451 until his death. He became Trésorier of the abbey of St. Martin in Tours in 1458 or 1459, and was highly favored by King Charles VII and his successors (who were the titular abbots of St. Martin), being renowned as a basso profundo and as a composer of rare originality. His date of birth, cited as anywhere from 1410 to 1430, is no more than guesswork, for there is simply nothing from his early life to specify it. The standard dating is 1410, now regarded as unrealistically early, while 1425 and 1430 have been cited much less often; 1420 has become more widely accepted in recent decades (but not in The New Grove II). He wrote 15 Masses, at least four motets, and enough secular songs to fill two CDs on L’Oiseau-Lyre (Fanfare 6:5 for the three LPs). A dozen of his Masses were composed on a chant cantus firmus, but the two Masses heard here are speculative Masses not based on a pre-existing model. The “Mass in whatever mode” has no clefs, so it may be sung in any mode. In 1992 George Houle published a set of four editions of the Mass, using the four maneria or pairs of modes—Dorian or mode 1 (on re), Phrygian or mode 3 (on mi), Lydian or mode 5 (on fa), and Mixolydian or mode 7 (on sol)—to yield four renditions that each sound different because the half-steps (mi/fa and ti/do) occur at different points in the melodies. Houle allowed that the Phrygian works best, the Mixolydian well enough, the Lydian and Dorian more poorly. The reason is the need to avoid tritones (both linear and harmonic) and mi contra fa by adding accidentals, which the singers must improvise as they sing, not an easy task now and probably not then either. This idea was not original with him, for it was implicit in the early recordings by Claude Panterne and Daniel Meier, both using the Phrygian mode, and explicit with Siegfried Heinrich (5:2) and Edward Wickham (23:1). Heinrich also sang the Mass in the Mixolydian mode, and Wickham added two movements in fa-ut to his recording, calling them Mixolydian as well. It reached its fulfillment in the recent versions by Lucien Kandel (32:2), who provided for the first time four full performances of the Mass. Another solution, proposed by the 16th-century Swiss theorist Glarean in his Dodecachordon (1547), indicated that the Mass could be realized on ut (do), re, or mi. Jaap van Benthem followed his approach when he published this Mass in his edition of all of Ockeghem’s Masses in 1994. The version on ut was recorded by Peter Urquhart in 1996 (not reviewed here), and this new version by The Sound and the Fury, annotated by van Benthem, offers all three possibilities, re (Dorian), mi (Phrygian), and fa-ut, which he calls “a combination of Lydian and Mixolydian.” This phrase would be hard to understand, but fa, which should be Lydian, transposed to ut sounds more like Mixolydian because of all the accidentals. This alone makes the discs by Kandel and The Sound and the Fury complementary issues, each a complete presentation of one approach. There is one more recording, of Clytus Gottwald performing his own arrangement of the Mass in the Dorian mode, a 1981 broadcast issued in 1998. The other disc in this set is very short, since it has only the Missa prolationum. The name refers to prolation, or time signature. Prolation is the medieval manner of dividing the semibreve into either three or two minims, while tempus is the division of the breve into either three semibreves (tempus perfectum) or two semibreves (tempus imperfectum). The music is written in two parts but each part is sung in a different tempus and a different prolation, making a double canon in four parts. The Mass begins with the Kyrie I as a double canon in unison, the Christe as a double canon at the second, the Kyrie II at the third, and so on up to the liturgical climax of the Mass at the consecration of bread and wine, when the double canon at the octave is sung to the Hosanna. (Hair-raising, I called it last time.) The magical effect on the hearers did not depend on knowing or understanding the technical feat—it was simply a profound musical effect. 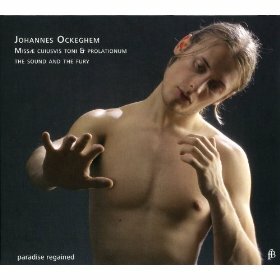 Later commentators found it irresistible to discuss Ockeghem’s techniques, detracting from an appreciation of the beauty of his music. This performance is practically identical in tempo to Edward Wickham’s (19:2), but both are much faster than Lucien Kandel’s stunning version (36:6). In the last seven years, The Sound and the Fury has made a dozen recordings of early Renaissance Masses for ORF and this related label, many of them first recordings. The familiar names among the five singers are tenors John Potter and Hans Jörg Mammel. Note that Kandel also recorded both Masses in separate issues and Wickham included both on separate discs of his complete sacred music of Ockeghem. (Gottwald’s radio broadcasts of both Masses have also been issued.) The new group sings one voice to a part, unlike the other two, with two voices to a part. This group has a countertenor on top and sings a tone lower than Wickham and a tone and a half lower than Kandel. (It is not clear how the four vocal parts of these Masses are assigned to the five singers, including three tenors.) The voices are captured up close, with countertenor Alessandro Carmignani rather prominent, while Kandel and Wickham both have a warmer sound. Kandel’s broader tempos in this Mass confer an added solemnity that is realized completely in the Hosanna. In a salient point that will be found hidden in tiny type, these performances were all recorded live (no date or place given), a rather remarkable feat for such complex music, the Missa prolationum having been recorded five years ago for the ORF Edition Alte Musik series. The note adds that a CD-ROM track on the second disc has scores, texts, and biographies, but my iMac shows nothing but the five tracks of music. Now that Naxos has imported the two latest issues of this ensemble, I hope to hear the earlier entries in this series. For now, we have a useful foil to the different approach taken by Kandel in these two fascinating Masses.